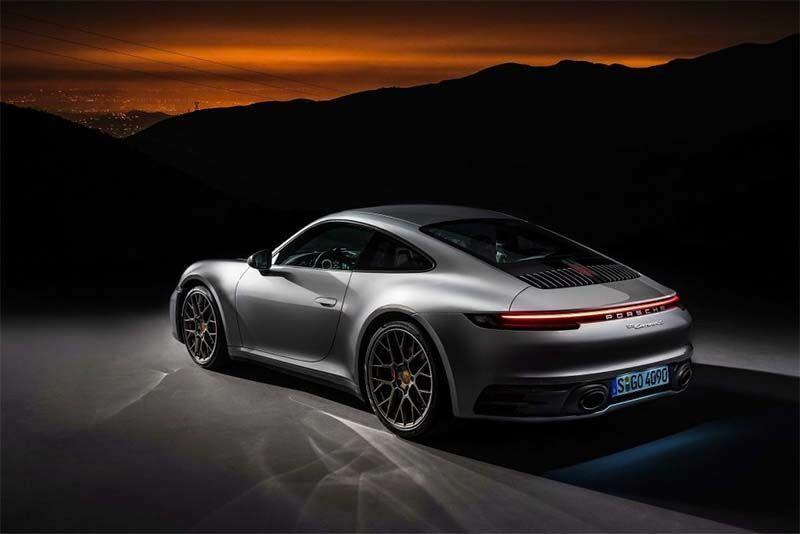 The new Porsche 911 has been revealed and it's more evolved than ever. It's version 8.0 of the evergreen Porsche 911 and its iconic lines have evolved notably from the model it replaces. In fact, it's probably one of the most distinctive changes in recent memory of the model's 55-year production. This new car, the 992 series, although almost identical in length, has a longer wheelbase, a wider front-end and is manufactured exclusively as a widebody, with an extra 45mm on the outgoing version. The wider nose provides improved front-end grip and creates a far more cohesive design too. And, talking of the nose, you'll notice more pronounced front wings housing the LED matrix headlights while recesses in the bonnet hark back to when the 911 was still air-cooled. Moving down the sides reveals electronic flush-fitting door handles, deeper side sills and larger rear wheel arches. The rear-end is certainly the 992s most distinctive feature, especially with that wraparound LED tail light integrated into the bumper. Sitting below, and also integrated into the bumper, are a pair of exhaust pipes exiting either side, flanked by vents. There's also a larger, vertically-slatted engine cover that encases a central high-intensity brake light that slots between the sleek rear window and a wide, retractable rear wing. Featuring only the 444bhp, 406lb ft 3.0-litre turbocharged flat-six engine at launch, paired with a new particulate filter and exhaust system, the 911 outperforms its predecessor in terms of acceleration. Albeit only 0.4 seconds quicker, it'll blast from 0-62 in 3.6sec and 3.7sec for the PDK Carrera S and Carrera 4S models respectively. Top speed stands at 190mph for the 4S and 191mph for the S.
Porsche say they will introduce a lower-powered version in early in 2019 for the Carrera and Carrera 4 models. Helping the Porsche 911 achieve these figures is an all-new PDK gearbox that's received an additional ratio, some new mechanicals and electronic components, including the shift mechanisms. Open the casing reveals an unoccupied area that will receive an electric motor should Porsche unleash a hybrid 911 on us. Although it's unlikely we'll see a hybrid anytime soon, Porsche has made provisions for future hybrid and electric powertrains with fixings and mountings for battery packs and motors. It makes the 992 50kg's heavier at 1600kg for the Carrera 4S though. The chassis is either the adaptive PASM damper system or Porsche's Sport chassis, lowering the ride height by 10mm and 20mm respectively on the outgoing car. There's also rear-wheel steering, torque vectoring and a mechanical limited slip differential, as well as a 'Wet' driving mode. Sensors in the wheel arches detect when the road is wet and automatically primes the stability control and ABS systems. The driver receives a notification and can choose to select the wet driver mode, if it tickles their fancy, via the rotary control on the steering wheel. For the first time, the 911 introduces different diameter wheels front to rear. The Carrera models receive 19- and 20-inch rims respectively, while the S and 4S models get 20- and 21-inchers. The interior is a revelation, with the facia receiving retro-designed chrome switchgear. The instrument display has an analogue rev counter in between two TFT screens. A 10.5-inch dash-mounted monitor controls the infotainment system, including things like Night Vision Assist and the Emergency Assist system connected to the radar cruise control. The glass-finished transmission tunnel houses a gear selector for reverse, park, neutral or drive – manual gear changes are accomplished with the paddles behind the new steering wheel only. We can't wait to get behind the wheel but, in the meantime, for those of you with £93,110 for the Carrera S and £98,418 for the Carrera 4S, Porsche will receive your order now.